Well, February was a bit more like winter. We were faced with a lot of windy days and the snow just kept coming. Cooler temperatures and inconsistent weather made conditions a bit tougher for fishing, but we still managed to put in our time. We alternated between Kootenay and Arrow Lake for the past month and have been rewarded for our efforts. Heres the latest news………. With the water temperature running around 37 degrees now, the fish have been a bit lethargic. We have adjusted our techniques a bit and have been able to hook into a few fish most days. Rainbows have been a bit elusive lately, however we are still hooking the odd one. Lucky for us, the Bull Trout aren’t as elusive. Most days have seen the odd rainbow, but more commonly we have been hooking into a couple Bulls each time out. 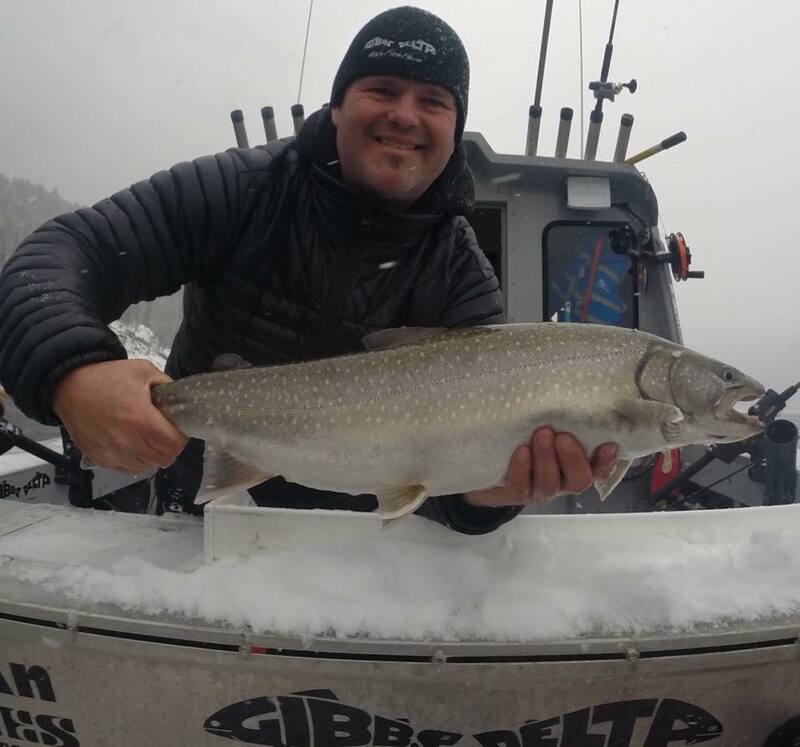 Rainbows between 2 -3 Lbs and Bull Trout between 3 – 10 Lbs have been caught in the past couple weeks. Looking forward to the weather finally smartening up and the fish will become more and more aggressive. 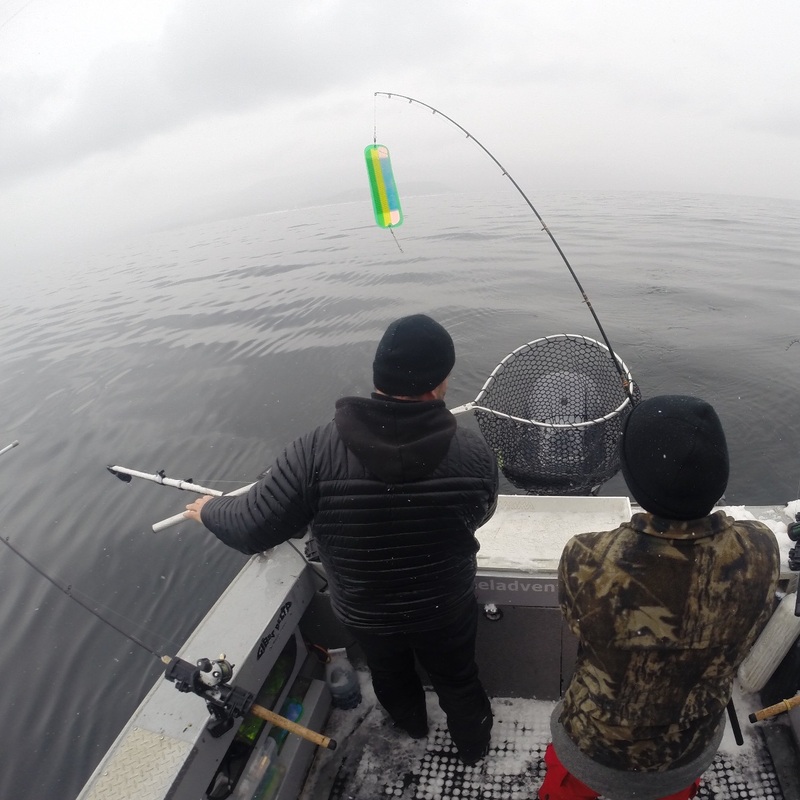 Stay tuned……..
We’ve been spending a lot of time on Lower Arrow Lake this past month and it has been kind to us. Still slower fishing, however the quality of the fish has made up for that. Most days we have been hooking into 2 to 5 fish. Mostly Bull Trout, but we have hooked a few Rainbows in the last little while. Feb 17th was the Scotties Marina annual derby and there were quite a few fish caught this year. It was nice to see most boats hooking into a fish or two. Weather was good for that day and fun was had by all. 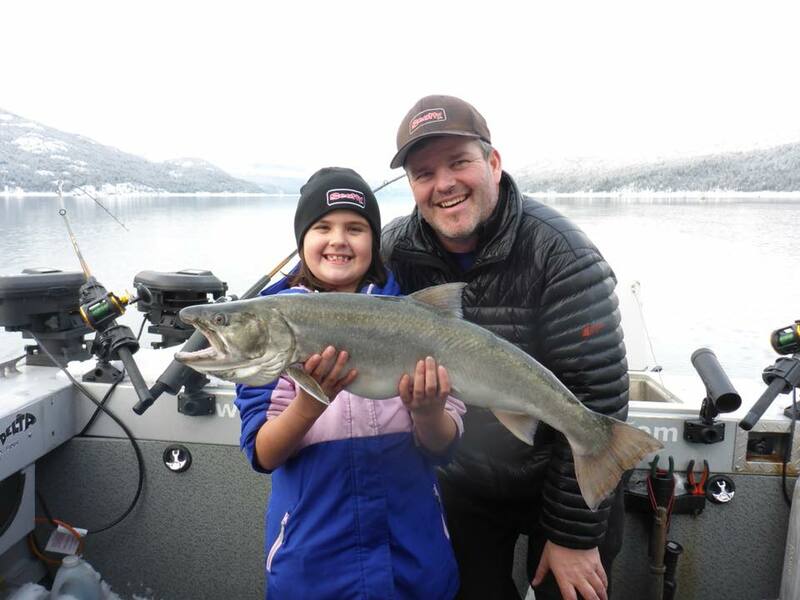 The biggest fish of the day was a beauty 15Lb Bull Trout, with a bunch more between 6 – 13Lbs. Since then we have been out a number of times and still manage to hook into 1 or 2 fish most days. We did a couple trips on the Columbia when we had a decent break in the weather. Both trips rewarded us with a few Rainbows each time. Best technique was float fishing from shore. Rainbows were all between 2 – 4 Lbs. Once again, we are awaiting some milder weather and look forward to hitting the river hard when weather permits. 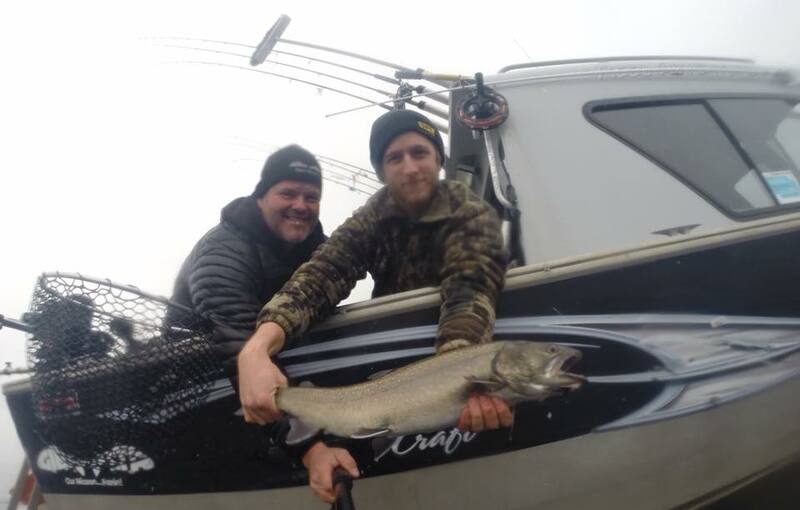 Usually March and April provide us with our biggest fish of the year on the river, so stay tuned………. We’ve managed to catch a few Rainbows on the surface with Buck tail flies, and a few on plugs and spoons. No particular colour of flies as of late, but my favourite Gibbs/Delta Croc spoons have caught a few. The brass/fire stripe croc has been the only somewhat consistent lure. Bull Trout, on the other hand, have been fairly consistent on my favourite flasher/hoochie combo. Or flasher & spoon combo has been working as well. The Gibbs/Delta guide series flashers in lemon lime or STS have been my best producers. Followed with a green spatter back or glow green pistachio hoochie. We’ve also caught a few on the ‘No Bananas’ skinny G spoon behind the flashers. Best depths lately have been between 50 – 100ft on Arrow Lake and between 75 – 150ft on Kootenay. With Spring Break coming, we are looking forward to spending more and more time with guests on the water this month. Lets hope the weather co-operates.